Gravity is a function of the center of the mass of the earth. The mass of the earth is not evenly distributed. A geoid is a mathematical model of where mean sea level is based on the gravitational pull at any location on earth. Check Wikipedia for more details. While the earth may appear to be a nearly perfect sphere, it isn't. Due to the rotation of the earth and other factors, it is slightly fatter at the equator than the distance between the north and south poles. The mathematical model of the shape of the earth is called an ellipsoid. All GPS receivers use one of these ellipsoid models in their position calculations. The ellipsoid is an appoximation of the geoid. Check Wikipedia for more details. GPS receivers calculate position based on the ellipsoid, but users generally want the elevation data to be relative to mean sea level (the geoid). The difference between the ellipsoid and the geoid is the undulation. Check Wikipedia for more details. What is a Geoid grid? Calculating the difference between the geoid and ellipsoid is an extremely complex calculation. In order to accelerate the process for GPS receivers, the earth is split into a grid and the geoid height is pre-calculated for every location in the grid. This is saved as a table in memory on the GPS receiver for quick lookups. What happens when I cross into a different Geoid grid? The geoid height is different for each cell in the grid, and the edges of these cells don't perfectly match. When crossing the boundary between grid cells, you may see a small elevation jump. 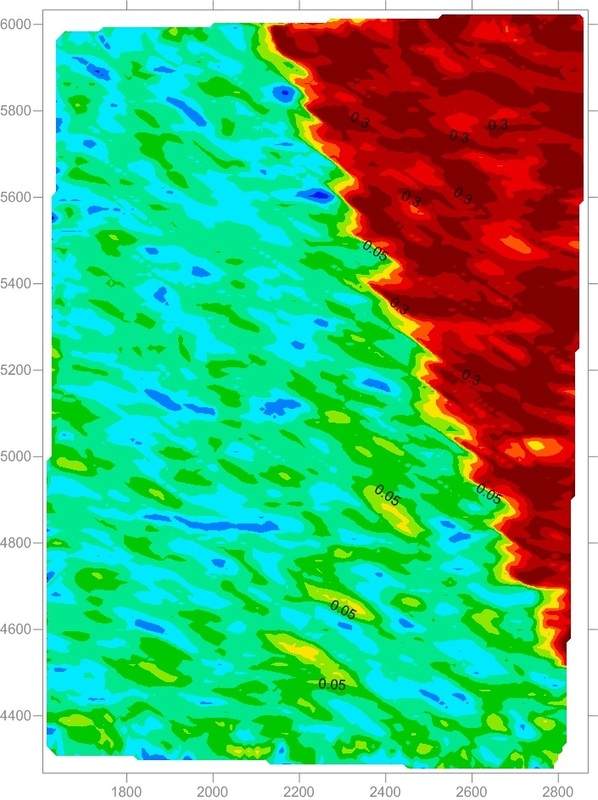 The image below is from a field that was "leveled" using the EGM96 geoid and then surveyed using a different geoid. You can visibly see where the boundary is between the cells of the geoid grid. In this case there was a 4 inch difference between the two planes. What Geoid should I use? That depends on what you're doing. For most users, EGM96 is preferred and is the factory default setting for NovAtel receivers. This geoid will provide the most accurate elevation data relative to mean sea level. The EGM96 table uses a grid cells that are 0.25° by 0.25°. NovAtel receivers also include a table for the OSU89B geoid, which has grid cells that are 2° by 3°. Alternately, you can manually set a geoid height. If you speficied a geoid height of 0, then the elevation data generated by the receiver would be from the ellipsoid only. This would be less accurate in terms of absolute elevation relative to sea level. This would also eliminate any possibly of the stair-step effect seen above. More information about the "UNDULATION" command can be found on page 211 of the firmware reference guide or in this document.